The nation's new TV channel, BBC Scotland, has revealed the first picture of the on-air team behind its flagship news programme. 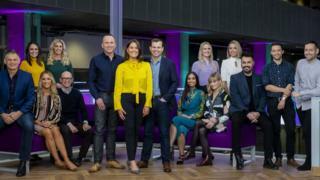 "The Nine" has a 15-strong core team of journalists who will bring the national and international news to Scotland in the nightly hour-long broadcast.Heading the team are presenters Rebecca Curran and Martin Geissler.And Chief News Correspondent James Cook joins the Nine from his post as BBC News North America Correspondent. Taking "a global view on the news while maintaining a distinct Scottish voice", the programme will feature a hand-picked team of reporters and correspondents who will cover social affairs, innovation, consumer matters, sport and entertainment. Editor of The Nine Hayley Valentine said: "I'm delighted with the team of presenters and reporters we've put together. "It has a great mix of experienced correspondents and new talent, all of whom are working on a raft of original stories for The Nine. "Our viewers will get some of the best analysis of Scottish, UK and international news from this team. And I'm confident viewers will enjoy a very different approach to news presenting and storytelling." The Nine will broadcast Monday-Friday between 21:00 and 22:00, in addition to weekend bulletins.Rebecca Curran and Martin Geissler will co-present Monday-Thursday while Laura Miller and John Beattie will present the news hour each Friday.On Saturdays, there will be a 15-minute bulletin at 19:00, followed by a review programme presented by Fiona Stalker and Nick Sheridan. On Sundays, the 15-minute 19:00 bulletin will be presented by Lucy Whyte. The programme also promises a distinct social media presence and can also be accessed on digital platforms.The Nine is part of the biggest investment in the BBC in Scotland for a generation, generating 80 new jobs in news services in Scotland, covering a range of roles both in front of and behind the camera. Rebecca Curran, PresenterRebecca moves into her new role as co-anchor after two years in BBC Scotland's busy Aberdeen newsroom. Widely recognised as one of the most tenacious broadcast journalists in the country, she has a wide-reaching and proven track record in reporting a diverse range of subjects ranging from hard-hitting investigations to moving human interest stories. She started her career at Northsound Radio and then spent three years at STV before joining the BBC in 2016. Martin Geissler, PresenterMost recently a news correspondent with ITN, Martin has reported on some of the biggest news stories this century: the Iraq war, the Afghan conflict, Hurricane Katrina, the Boxing Day tsunami, the crisis inside Zimbabwe, and many more. Previously Europe, Africa and Scotland correspondent for ITN, he started his television career with Sky News in Scotland and has worked as a reporter and presenter for STV and as a correspondent for Sky Sports. James Cook, Chief News CorrespondentJames joins the Nine as Chief News Correspondent from his post as North America Correspondent for BBC News where he reported on major stories from shootings and racial unrest to wildfires, hurricanes and Donald Trump's presidency. Starting his career in local radio, he moved to the BBC in 1998 as a sub-editor. He then presented news programmes including Reporting Scotland and Good Morning Scotland and was appointed Scotland Correspondent for BBC News in 2008. Laura Miller, Consumer Affairs CorrespondentLaura joins the Nine from her role as the East of Scotland news anchor on STV's News at 6. As a reporter, she's covered some of the biggest stories of recent times, including the Independence Referendum, the Clutha helicopter tragedy, the 2014 Commonwealth Games in Glasgow and the 2012 Olympics in London. Amy Irons, Sports PresenterAmy, an experienced news, entertainment and sports presenter, joins the Nine from the Capital Radio Breakfast Show. An accomplished self-shooting video journalist, she graduated in multimedia journalism from Glasgow Caledonian University and then joined West FM as a news and sports reporter. From there, she joined STV before moving to Capital Radio in 2017. Laura McGhie, Sports News PresenterLaura has worked on digital and radio sports news at BBC Scotland for the past five years. She covered last year's Commonwealth Games in Australia and has also reported on Scottish football, Women's Six Nations rugby and golf's Scottish Open and Women's British Open. Jean joins the Nine from her post as senior reporter on BBC2's Bafta award-winning Victoria Derbyshire programme. Before that, she was a reporter for BBC London News and political reporter for Radio 1 Newsbeat. Rajdeep Sandhu, Westminster CorrespondentAs winner of the prestigious BBC Gareth Butler trainee scheme, Rajdeep spent a year working across online, radio and TV and then became political reporter for BBC Radio Kent. She will be at the very heart of British politics and reporting on how it impacts on Scotland. Lynsey Bews, Political CorrespondentLynsey studied journalism at Strathclyde University before starting her career in local newspapers. She joined the Press Association in 2010 as a political reporter, based at the Scottish Parliament. Since then she has reported on election campaigns and the independence and EU referendums. David Lockhart, Political ReporterDavid worked at BBC Scotland as a trainee in the run up to the Scottish independence referendum in 2014. After that, he joined BBC Question Time, covering two elections and the Brexit referendum. David has been producing Question Time for the past two years. Chris Clements - Social Affairs CorrespondentChris spent nearly a decade in newspapers before moving into broadcast in 2017. During a four-year spell at the Daily Record, he broke a number of exclusives including an investigation into abuse in youth football. He moved to STV News where he covered issues including minimum-unit alcohol pricing and childhood obesity. Laura Goodwin, Innovation CorrespondentLaura has been a broadcast journalist for 12 years. She began her career at Moray Firth Radio in Inverness before moving on to STV News North where she spent 11 years as a reporter and presenter. Chris McLaughlin, Sports News CorrespondentWith a background in commercial radio, Chris joined BBC Scotland in 2004 and quickly became a key member of the sport team's operation, working across TV, radio and online. In 2010 he became BBC Scotland's Senior Football Reporter and has reported on stories including the financial collapse of Rangers and the Scotland national team's continued frustrations on and off the pitch. David Farrell, Entertainment ReporterDavid has a wealth of live broadcast experience. He co-presented STV's Live At Five, which won an RTS Scotland Award for Best Daytime Programme, and picked up a Sony Radio Award for his celebrity-based evening music programme on commercial radio. » Six Nations: Who would make your greatest ever Scotland rugby team?